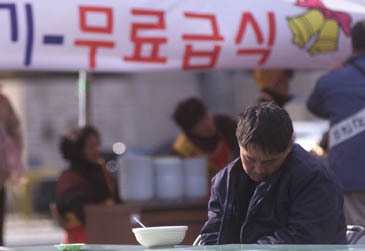 A homeless man is asleep at a free meal facility in South Korea during the economic crisis of the late 1990s. Numerous people were driven to the street and became homeless during the period. A decade after the 1997 Asian Crisis erupted, most housing markets in Asia are well on their way to recovery. Boosted by strong economic growth and strong local and international demand, residential real estate prices in the Philippines, Singapore and South Korea rose by more than 10% in nominal terms y-o-y to Q1 2007. In Hong Kong, after registering price falls in early 2006, the over-all residential price index is back in positive territory. The index rose 5.2% y-o-y to March 2007. However this is significantly lower than the annual price increases to the first quarter of 2005 and 2004, at 21% and 28%, respectively. Although property prices in most Asian countries are still below their peak levels, rapid price appreciation has taken place over the past five years, leading to renewed fears that a speculative property bubble is forming in several Asian countries. The fear is not unfounded; one has only to recall Asia's spectacular and disastrous property bubbles of the 1990s. However, the recent price increases are actually recoveries from the previous slump caused by the Asian crisis and other phenomena (read previous article on Asia's weak housing markets). As of Q1 2007, property prices in most Asian countries are in fact still below their peak levels in real terms. Current economic and monetary conditions suggest continued strong demand for housing. All economies affected by the Asian Crisis grew by 5% or more in 2006. GDP growth from 2002 to 2006 has been markedly stronger than during the crisis period - 1997 to 2001, although slower compared to the tail-end of the "Asian Economic Miracle." As a result of financial and monetary reforms implemented after the crisis, banks and other financial institutions are in much better shape now. Asia's mortgage market is set for a boom (read article). This is despite the fact that mortgage lenders are more cautious of over-exposing themselves to particular sectors (some pundits worry that banks are actually being too cautious). Despite recent interest hikes, in line with global interest rates, base interest rates for mortgage lending are generally lower now than before the crisis. Socio-economic conditions also point to continued strong demand for residential properties. Strong urbanization and population growth has led to high population densities in several Asian cities. In view of the relatively restrained dwelling price rises, strong economic growth and banking sector caution and healthy yields to be enjoyed on properties in Asia, talk of another bubble seems far-fetched. A more pressing concern for Asian economies is the continuation of reforms to improve real estate efficiency and transparency. Transaction costs remain high and the property registration is still cumbersome in several countries. While Malaysia is encouraging foreign property buyers, Thailand's military junta is pushing them away. Thailand announced that it is completing a crackdown on foreign companies established for the sole purpose of buying landed properties. While the motivation for this move is unclear, the signal is clear "foreigners are not welcome." Political uncertainty and policy flip-flaps by the ruling junta are undoubtedly hurting the real estate market. In the Philippines, proposed property market reforms are languishing in congress. These laws include the establishment of a centralized agency for registering property and a standard property valuation system.